Lang Vei was, in January 1968 just prior to the infamous Tet Offensive, the northern most and perhaps the most isolated and fortified of the sixty four Special Forces camps established along the border of South Vietnam and its' neighbours, Laos and Cambodia. Less than a mile from the Laotian border to the west, the camp was seven road miles and five air miles from the Marine Corps' combat base at Khe Sanh. At that time the Lang Vei Special Forces camp was occupied by an A-team commanded by Captain Frank Willoughby, and run by his team sergeant, Sfc William T. Craig. The rest of the team, designated A-101, consisted of the executive officer, 1st Lt. Miles Wilkins, Sfc James Holt, Sfc Kenneth Hanna, weapons specialist, Ssg Emmanuel E. Phillips, radio operator, Ssg Arthur Brooks, weapons specialist, Sgt Nickloas Fragos, medic, Sp4 William G. McMurray, radio operator, Sp4 Franklin H. Dooms, radio operator, and the newest member of the A-team, Sp5 Daniel R. Phillips, explosives specialist. The perimeter was shaped much like a dog bone. The long axis of the camp ran almost east/west. Within the perimeter, which was protected by triple concertina and some German razor wire, were originally almost three hundred Civilian Irregular Defence Group, (C.I.D.G), mostly Bru tribesmen. 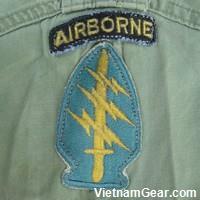 The next higher headquarters for the Lang Vei Special Forces unit was in Da Nang, nearly a hundred miles away. Company C of the 5th Special Forces was commanded by LTC Daniel Schungel. In December 1967 Schungel had dispatched a Mobile Strike Force (Mike Force) to Lang Vei to lend assistance to Willoughby's A-team. Consisting of six Green Berets and a company of Hre Montagnards numbering about 160 men, the MIKE Force was commanded by 1st Lt. Paul R. Longgrear. His Green Beret platoon leaders were: SFC Charles Lindewald, heavy weapons specialist; SFC Harvey G. Brande, senior medic; SFC Earl Burke, heavy weapons specialist; and SGT John Early, light weapons specialist. Longgrear also commanded medic SP4 James L. Moreland. The MIKE Forces were distinct from the C.I.D.G., who normally served own tribesmen as officers. Led by Green Berets, the MIKE Forces were more thoroughly trained and airborne qualified. They were mercenaries, to be sent wherever needed, and their pay was determined by the number of captured enemy weapons they returned after each battle. With four of his Green Berets as troop handlers (Moreland was the medic and not in a command billet), Longgrear was intensely training his company of Hre who had acquired a perhaps undeserved reputation for breaking under fire. Willoughby was careful to separte the mercenary Hre from his Bru C.I.D.G. The Hre were assigned to the Observation Post (OP) about half the distance between the camp and the Lao border. They would be the first to feel any attack from the North Vietnamese Army (NVA) if they came from the west. It was the job of the Hre Montangards to patrol their surrounding area constantly, looking for signs of enemy activity. Willoughby and Craig had positioned their 'Yards to effectively secure the perimeter. Each of his four Bru companies in the corners of the dog bone ends: 102 Company had the northwest sector, 103 the southwest sector, 104 the southeast sector and 101 the northeast, along Route 9 closest to Khe Sanh. In the long midsection were probably his best Vietnamese troops: the 1st Combat Reconnaissance Platoon (CRP) manned the north central perimeter paralleling Route 9, the 2nd CRP had the south central perimeter, while the 3rd CRP was along the eastern wire in the rear of the 101 Company near the POL (Petroleum, oils and lubricants) dump. The Lang Vei camp had only one 4.2 inch mortar, its pit near the centre of the camp. They also had seven 81mm mortars and nineteen 60mm mortars dispersed throughout the perimeter. Only two 106mm recoilless rifles were on hand. There were no anti-tank mines in the perimeter wire. There had been no record of any enemy tanks being used in the attack in nearly three years of heavy American involvement and the Special Forces had standing orders not to use anti-tank mines anywhere they had indigenous personnel inside the perimeter. Even the claymores, the deadly directional anti-personnel, were set for command detonation. The Green Berets had received airdrop shipments of one hundred Light Anti-tank Weapons (LAWs). The camp had only two of the relatively new M60 7.62mm machine guns, but did have two of the aged buy powerful .50 calibre machine guns, and thirty-nine of the World War II Browning Automatic Rifles (BARs). Most of the C.I.D.G. were armed with M-1 and M-2 carbines, of Korean War vintage. Willoughby had, as of the 14th January, two companies of Marines ready to move by foot or helicopter to his rescue, should the need arise. The Marines could not just race their M-35 trucks down Route 9 to the rescue, as the NVA would surely have an ambush waiting for them. Willoughby also knew that a helicopter landing in a hot landing zone (LZ) could prove a disaster to his relief column. Additionally, there were several MIKE Force companies standing by in Da Nang, ready to jump into hell to save him. The captain knew his situation was precarious, but that was what was expected of Green Berets. The situation was getting a bit more tense for Willoughby and his A-team as additional intelligence reports came in. They knew that Khe Sanh village had been evacuated to the communists on the 21st January. That made it very clear that a rescue would almost certainly have to be by helicopter if it were needed, since Khe Sanh village lay between the Lang Vei camp and the Marine Combat Base at Khe Sanh. One of Longgrear's MIKE Force patrols that had recently crossed into Laos in “hot pursuit” of a fleeing enemy unit had discovered the telltale tracks of armoured vehicles that had been recent enough to indicate that the NVA, contrary to the belief of the senior Marine commanders in the I Corps, did in fact have tanks in the vicinity of Khe Sanh. Longgrear was on patrol on a cold, overcast morning 24th January when a ragged looking 33rd Royal Laotian Elephant Battalion, complete with wives, children and other relatives came marching down Route 9 toward him. They were fleeing from their homeland after being mauled two days before by NVA regulars less than ten miles away. During that battle, Khe Sanh had received a frantic all for help from Tchepone, a Laotian Army post just inside the border. Two planes were dispatched to help, but the bad weather prevented them from even seeing the enemy. The Lao colonel told Willoughby that his unit had been attacked by tanks leading units of the NVA 304th and 325th Divisions. But Willoughby wasn't fully convinced. The Lao were carrying no casualties, and their weapons looked too good to have come through such an ordeal so recently. The colonel wished speak to someone of his own rank, and left to take his people to the old Special Forces camp at Old Lang Vei. Willoughby immediately contacted company headquarters in Da Nang regarding his immediate need for a field grade officer as well as six Green Berets. A six man team arrived the next day, along with some ammunition, food and medicine. They also brought materials to help restore the defensive postions at Old Lang Vei. Willoughby's doubts as to the authenticity of the colonel's claims, especially regarding the tanks, insulted the Lao colonel, and he refused to answer any more of Willoughby's questions. The standoff between the colonel and Willoughby ended when the executive officer of Company C in Da Nang, Major Hoadley, arrived to act as a liaison officer with the Laotians. On the 30th January NVA private Luong Dinh Du made his way past the sleeping Bru guards at the camp gate and surrendered to a surprised Bill Craig. Du was a veteran of the NVA 304th Division, and his infantry regiment had been battered by a pitifully small number of U.S. Marines and U.S. Army advisors on the 20th January in Khe Sanh village. Although he professed no personal knowledge of any tanks, he did tell the Green Berets that they would be attacked soon by his nearby unit. He said that the camp had been the object of close reconnaissance by the battalion executive officer and a sapper squad just two days before the orders were executed. The Green Berets passed the private to the Marines at Khe Sanh, where more intense interrogation determined that he had heard noises made only by clanking tank treads, but he never actually saw the tanks. The Marines at Khe Sanh remained sceptical. Also on the 30th January, two other significant events occurred to the Lang Vei garrison. The Green Berets on patrol in the shallow Xepone River found an underwater road, which was not observable except by close inspection. Additionally, SSG John Young one of the SF men sent to Old Lang Vei on the 25th January, was captured while accompanying a Laotian recon patrol northeast of Lang Vei. On the 31st January, a MIKE Force patrol from Lang Vei was probing the area in the direction of Khe Sanh village and surprised an NVA battalion. In the short but lively fire-fight that included air strikes, the MIKE Force pulled back with a victory that claimed 54 NVA killed and 30 weapons for the bank accounts of the Hre mercenaries. When Willoughby got the news of this action, he decided that one MIKE Force platoon would suffice on the OP. The other platoon would be brought back to strengthen the camp's defences. The camp radio provided the news of the country wide Tet Offensive. Willoughby knew he was in for big trouble. The first five days of February passed with the Lang Vei defenders continuing their patrolling and watching and waiting. This is not to say that these were boring days, because the NVA were practicing mortar and artillery registration, seemingly at the times that supply helicopters were landing or taking off from the camp. On the sixth of February, the commanding officer of Company C, LTC Schungel, helicoptered into relieve his XO. Maj. Hoadley. The same day, Lt Bailey, whose job was to operate the second 106mm recoilless rifle in the event of attack, left for Da Nang for several days to take care of some personnel matters. Though some omission, no replacement was designated for the operation of this key weapon. The morning of the sixth brought mortar rounds screaming into the Lang Vei camp. The defenders replied against the suspected enemy mortar positions with 4.2 inch mortar fire. In the early evening the defenders received another dose of the same medicine from Co Roc Mountain in Laos. Casualties were light, but nerves were getting a little frayed. Again the camp responded to the incoming with some outgoing of their own. When Longgrear performed his nightly ritual of sending a Hre platoon to the OP commanded by Lindwald and Hanna (he always sent two Green Berets on the nightly mission), he realized that they couldn't have gotten much farther than the main gate when a volley of fire resounded. The Hre mercenaries were rapidly returning to the safety of the camp. The two Green Berets, following their spooked platoon, reported immediately to Longgrear. Schungel joined them, trying to find out what was happening. The sergeants explained that the Hres saw what they believed were many VC, and panicked. Longgrear again ordered the Hre to the OP, but they defiantly refused to go. Schungle was fuming. Longgrear explained that they were making him and his sergeants look very bad in front of his senior officer. Finally, by appealing to the Oriental mind and the loss of face, which they understood, he convinced them to go. At approximately 1800 hours the ground that the Lang Vei camp sat upon shook from an intense barrage of about fifty rounds of 152mm artillery fire from the direction of Co Roc Mountain. Counter battery fire erupted from the Marine artillery at Khe Sanh as well as the camp's own 4.2 inch mortar. The entire enemy barrage landed in the wire on the southern perimeter in 104 Company's tactical area of responsibility. Two of the C.I.D.G were wounded. When the barrage ended, Schungel, along with the commander of the ARVN Special Forces unit, Lt Quan, and the operations officer, Lt Quy, spent the dying moments of the daylight checking the perimeter. At about 1930 hours, Willoughby received a radio call that the C.I.D.G from 104 Company could hear engines running. Soon thereafter, Hanna and Lindewald called to report noises near the OP. They next reported three trip flares being set off in their area at about 2100 hours. Illumination revealed nothing. A few itchy trigger fingers among the Hres at the OP fried in anticipation. More of the OP defenders opened up and soon the fever spread to the whole camp. An hour later, 104 Company reacted in the same manner to activated trip flares. Atop the command bunker, or Tactical Operations Center (TOC), was a small observation tower. Fragos went on guard duty in the tower at noon on the 6th February. The quiet sky came alive in the late afternoon as the communist's 152mm guns at Co Roc opened fire. At nightfall, Fragos' tension level, as well as those on guard, increased markedly. Scanning the perimeter of the camp, he had seen the reaction of the guard contingent to the trip flare in front of 104 Company for about fifteen minutes, and then quieted down once again. Fragos had a visit from his team sergeant about a half hour before midnight. Craig then returned to his bunker to try to grab some sleep. Read The Magnificent Sacrifice - part II.